Strapped for time and need to whip up a quick dessert or bake-sale treat? 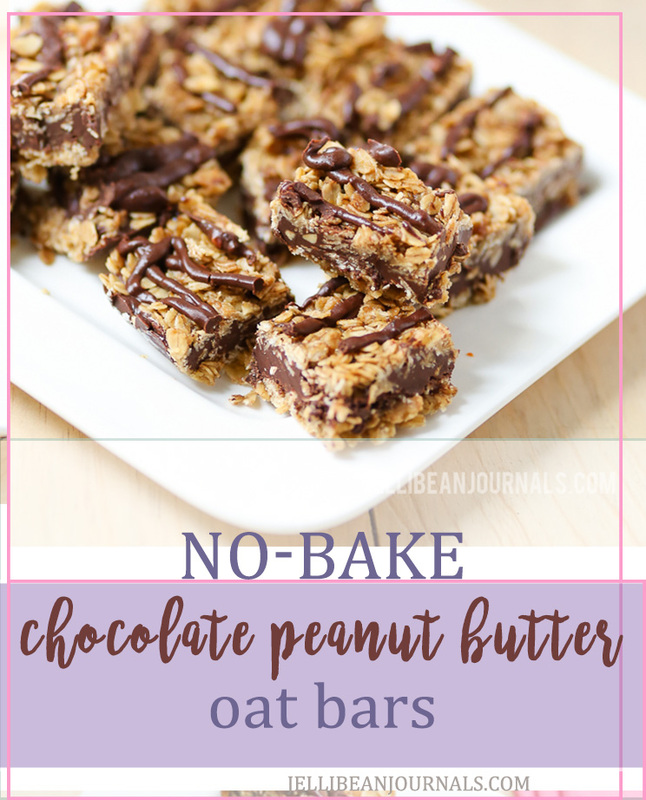 Sink your teeth into easy no-bake chocolate peanut butter squares loaded with satiating oats, rich chocolate, and mouthwatering peanut butter. Ladies, these are my new last-minute go-to treat. I’m seriously in love. They satisfy my sweet tooth with a hearty dose of chocolate, and really do a good job filling me up! The kids love ’em too… when I’m willing to share. And do I really need to talk about the match made in heaven between chocolate and peanut butter? This blog speaks for itself. Consider peanut butter cup panna cotta, chocolate chip cookie peanut butter cheesecake cups, the best chocolate cupcakes ever, and peanut butter avocado brownies, for starters. These chocolate peanut butter squares are perfect for filling up the neighborhood kids’ bellies when they take over your carport, are the perfect companion to a church potluck, sell out fast at community bake sales, and even make a fun treat to pack into your kids’ lunchboxes. Bonus points if you cut them into fun shapes! 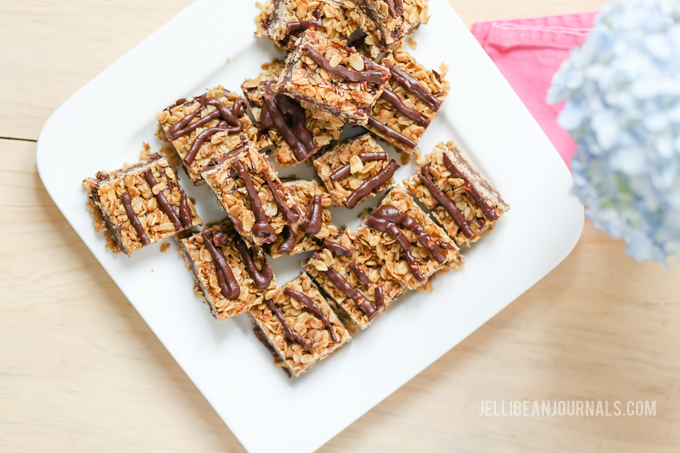 These chocolate peanut butter oat squares are very flexible. You can add ingredients, (coconut anyone?! ), use any kind of chocolate chips you’ve got on hand, rolled or instant oats, creamy or crunchy peanut butter, or really, any nut butter your family loves. I’ve even thought about giving them a good dose of rainbow sprinkles for my daughter’s next birthday. Yum. 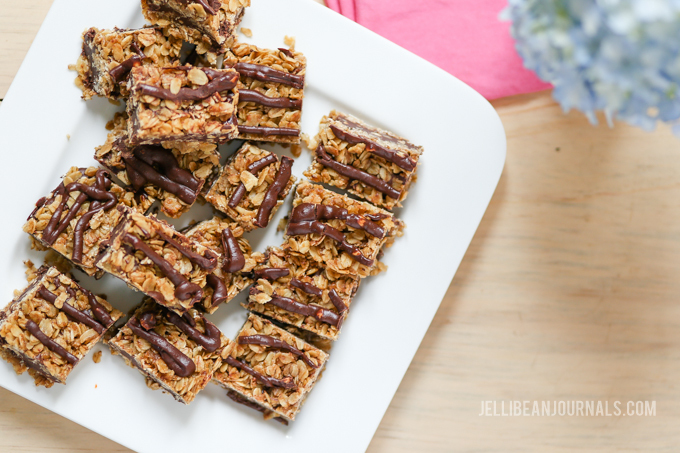 Chocolate peanut butter oat squares . Just do it. Generously butter a 9" square baking dish. In a small pot, melt butter with brown sugar until sugar dissolves. Stir in vanilla and oats. Cook over low heat 3 minutes more, stirring frequently. Pour half the oat mixture into the baking dish and press down. Over low heat, melt chocolate together with peanut butter stirring occasionally. Spread over oats reserving about 2 Tablespoons of the chocolate pb sauce. Spread remaining oat mixture over the top and gently press down. Drizzle with remaining chocolate-peanut butter. To make drizzling easier, spoon chocolate pb into the corner of a ziplock bag, snip the corner off, and squeeze onto the bars. Allow to cool and then refrigerate 2-3 hours before slicing and devouring. What are your favorite no-bake desserts? With 3 kids on the go and a busy schedule just like yours, I’m always looking for quick dessert recipes to spend more time with family and less time in the kitchen. Please share your faves in the comments. I can’t wait to read them all!